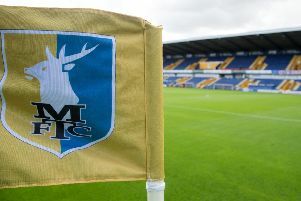 Boss David Flitcroft says Mansfield Town are now better placed to make their promotion dream a reality than they were 12 months ago. Flitcroft failed to guide promotion-chasoing Stags into the play-offs last season after taking over from Steve Evans in March this year. But, after a summer of intensive work with the players and the ability to make his own signings, the former Bury boss is confident his side has now got what it takes. “It was difficult when I took over last season, the squad was more experienced but there were too many players,” he said. “There were probably 35 players and that’s over 20 players who you have to explain why they are not playing. “You can only pick 11 players so the squad was too big and lacking young players and energy. “I have brought six or seven youth players in as well as experience like Neal Bishop, what a fantastic player and pro he is. “The balance of the squad is good, there is real togetherness and it’s great to have the energy that we have. We have got a really good dressing room. “We are in with a real chance of going up, When I recruited the players I spoke to them about how it was going to be a tough challenge, a tough challenge mentally, technically, practically and physically every day. “Every day it is a pressure environment when the expectation is so high that we have got to get out of this league. And Flitcroft also feels he has now stamped his own playing style on his Mansfield side, which has lost just one of their 19 League Two fixtures. “You have got to stick to your beliefs and your plan. I love football and all we have ever done from a young age in my family is talk about football and how it should be played,” he added. “When I went to Mansfield I went with a real plan and we have now got that style in place. “It has taken four to five months to get the boys up to the level and running the distances required. “I have got my own players in now who can play through the pitch and we are now the most expansive team in the league, along with MK Dons. “We have got a good style and that is what pleases me the most. Mansfield fans want to see a good style. “It is about winning matches and we have been able to do that and implement the style.